Has anyone else experienced the magic of watching their dad become the most amazing grandfather ever? For those who have, they know that there is nothing that restores the heart like watching your parents with your child(ren). It's amazing. Profound, even. I find myself awed by the parent my dad was and enchanted by the childhood my parents gave me that I couldn't see from this perspective. Because when my little girl runs to her G Pops and throws herself into his arms, it's a parallel to the nights Dad came home and Erik and I ran to the door to greet him, throwing ourselves about him. When he tosses his grandbaby in the air and roughhouses with her and I hear her raucous giggling and shouting "More, G Pops! ", I'm transported to the summer days when my dad taught me how to properly throw a frisbee ("it's in the wrist! "), or the afternoons he coached my soccer teams, or the early morning surf-and-splash sessions at Topanga followed by peanut butter and jelly on the a warming-in-the-sun wet towel. If you know those moments, you know how heartbreaking it would be to hear your dad was sick or injured, as we did a few weeks ago. Dad fell, cracking his head and breaking a few ribs. OUCH. He had been with us in Solana Beach only a few days before, tossing that little girl around in the pool. My dad is larger than life. He rides a motorcycle and surfs regularly at 66. He manages rock bands and travels the world. He drives down to SD for the day, flies to Taipei (where Erik now lives) for a couple of days just to meet his baby grandson. This is not the "sit on a blanket and read to the grandchild" kind of grandfather. He's a bongo-boarding, jetset, wild-and-crazy, never-gonna-stop guy. Thank goodness for my youngest brother Adam who was there (and has been ever since) every step of the way, driving him to the doctor, making sure G Pops wasn't overdoing anything - which is a mighty, mighty feat. True to his nature, he was going nuts just "resting" by the second afternoon, resisting Adam's help and basically acting like one of his grandkids. This man was re-planting the garden on day 3 and back on is motorcycle a week later, cracked ribs and all. UGH. What can a devoted Daddy's Girl do? Well, y'all know me by now, so, I won't keep you in suspense: I baked. Dad's favorite is apple pie, a throwback to my mom's cooking and those fabulous organic, home-grown hippie days in sun. Did I ever tell you we had a little farm in our backyard in Beverly Hills? My parents were so committed to fresh food, they grew it where most people were putting in pools and tennis courts. 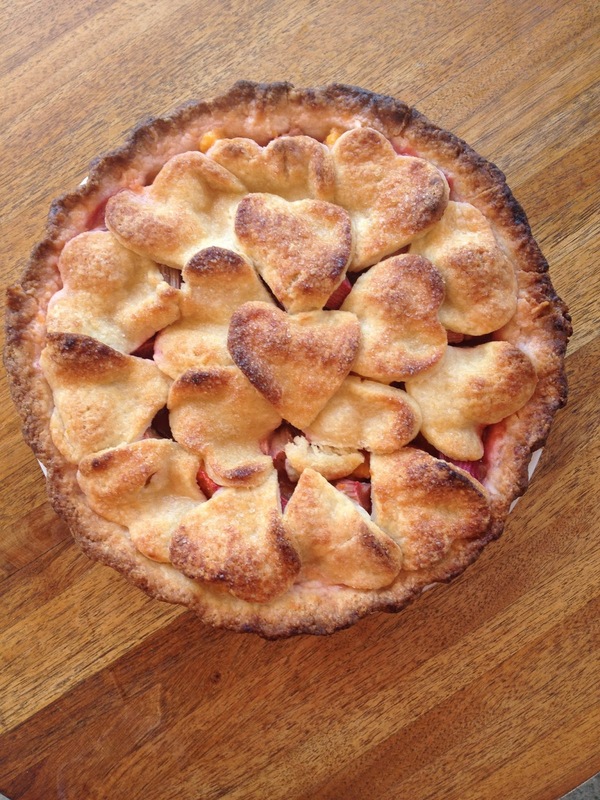 Anyhow, back to the Love Pie. 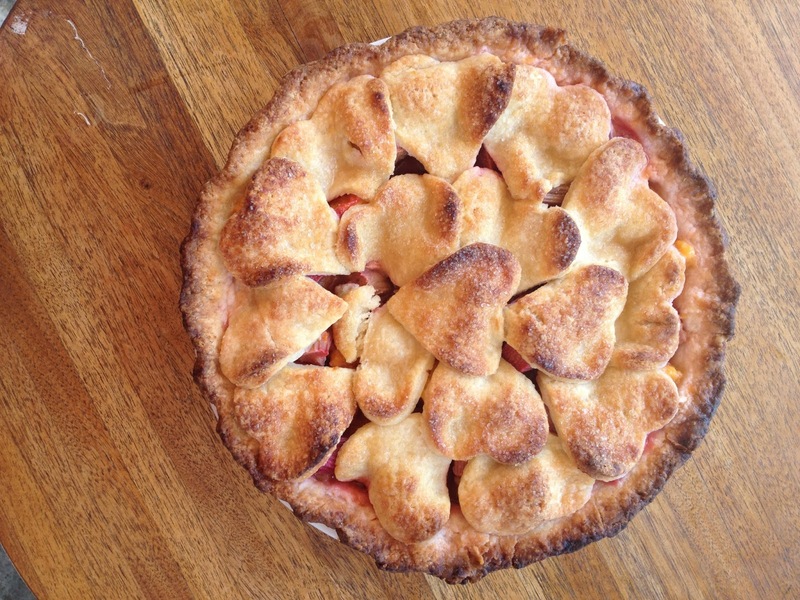 Dad loves rhubarb and it's peach season, so, it seemed only natural to combine them and toss them into my special cream cheese pie crust - a crust that is the ONLY pie crust recipe you'll ever need. Most can't place exactly why they love this pie crust, but they will most certainly tell you it's the best pie crust they've ever had. Thanks, Rose Levy Beranbaum, for so many compliments over the years and thanks, Dad, for buying me this book! The recipe below is truly an easy one. It's a little waiting for the crust to harden in the fridge, and a little rolling out the dough, and a little prepping the fruit, but it's not complicated and will turn out a delicious result. Dad cut it up at the lunch table, everyone dipping their forks into the same plate for some reason (because, that's family? 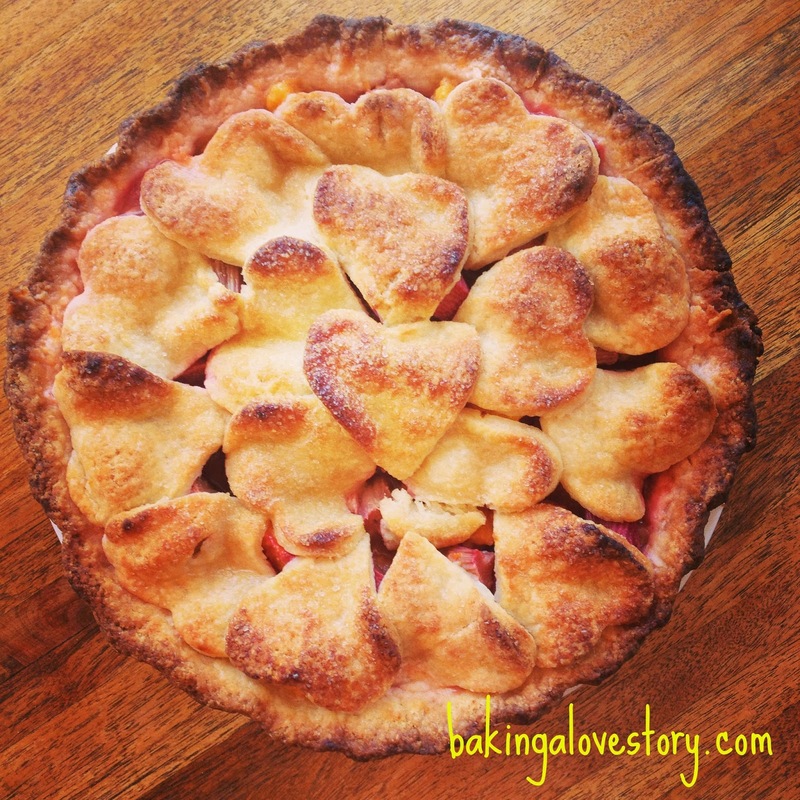 ), and gobbled the sweet, fresh, Love Pie all up. Sure, it was good. But the best part was seeing a smile pass across my dad's tense face. He'd been talking out the side of his mouth from the rib pain, but all of a sudden, he just relaxed, SAT DOWN and ate. And that was worth the waiting and the rolling and the prepping and the driving to LA from San Diego. That moment, when he enjoyed what I made for him, as I enjoy what he made (and still makes) for me every day of my life, was worth it all. Butter a 9" deep dish pie dish and set it into the fridge. Make the pie crust. Mix the flours & salt in a food processor, about 30 seconds. Add the cream cheese and pulse 6-10 times, until the mixture resembles a coarse meal. Add the frozen butter and pulse until the butter is in pea-sized pieces, about 8-10 times. Add the water and vinegar and pulse another 3-6 times, until the mixture starts coming together. It will still be in bits, though. Divide the dough into halves and place each half into its own plastic bag. One at a time, knead each mixture from outside its bag until each holds together in one piece. Then, form the halves into 2 discs, cover in plastic and refrigerate 45 minutes. Make the fruit filling. Pour all the fruit ingredients into a bowl, toss with a plastic spoon until the fruit is coated and set into the fridge until your crust is ready. Preheat the oven to 425 20 minutes before baking and set your rack on the bottom level. Roll out the pie crust, place in your pie dish. Fill with fruit mixture and cover with the second pie crust. Crimp the edges - this is a reeeeally juicy pie, so, make sure your edges are firmly together - and slice 4-2" openings in the top crust to let some steam escape during baking. Bake the pie 45 minutes, but check it at 30 to make sure the edges aren't burning. Cool at least 3 hours before cutting. It will still be warm. Soften some vanilla ice cream about 10 minutes before serving and prepare the experience a little summer heaven! Thanks Melissa! You'll love the pie and my dad is already fighting, that's for sure. Yes, Becky, please make it and let me know how it turns out. I'll bet your hubby loves it! I've never baked a pie before but this inspired me! I'll let you know how it turns out! Yes! Christine, it will come out beautifully. If not, I'll refund your money. ;) Baking is very nurturing. Enjoy! What a nice tribute to your dad, the joys of pie and to our gorgeous state of California. Hope your dad feels better soon!